The absorption of visible light and its conversion to other forms of energy is at the heart of some of the most fundamental processes in biology. A familiar example of light absorption initiating a biological response is the primary event of vision where light activates the photo-sensitive retinal chromophore in the first step of a complex process which ultimately culminates in the stimulation of the optical nerve. Light-sensing in photoreceptor proteins is subtly modulated by the multiple interactions between the chromophoric unit and its binding pocket. Rationalizing the essence of the regulatory mechanism of absorption is of fundamental importance not only to understand a specific photoreceptor but also to get a more general appreciation of how these light-sensing systems have optimized their structure and molecular composition. Using prototypical photoreceptor systems, we have revealed the molecular mechanism underlying these interactions and regulating the spectral tuning. In particular, several residues are found to actively tune the excitation both differentially stabilizing ground and excited states, and through fundametaly quantum "inductive resonance" interactions. R. Guareschi, O. Valsson, C. Curutchet, B. Mennucci, and C. Filippi, Electrostatic versus resonance interactions in photoreceptor proteins: The case of rhodopsin J. Phys. Chem. Lett. 7, 4547 (2016). 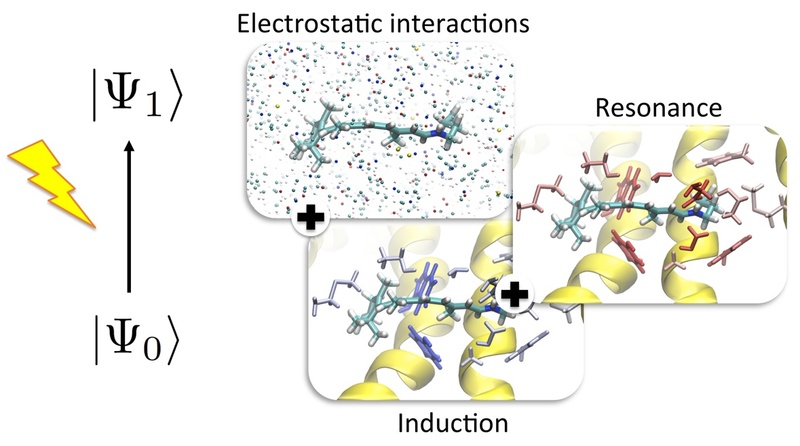 C. Daday, C. Curutchet, A. Sinicropi, B. Mennucci, and C. Filippi, Chromophore-protein coupling beyond non-polarizable models: Understanding absorption in green fluorescent protein J. Chem. Theory Comput. 11, 4825 (2015).